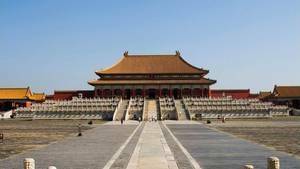 The Forbidden City of Beijing is famous for having been the imperial palace of the Ming (1368-1644) and then Qing (1644-1911) dynasties, but it is not the only reason why it is so interesting to see. This palace is also a model of feudal Chinese architecture, an architecture that represented the culmination of the art of this civilization, from the Pacific to Asia Minor. The various elements that compose it, its symbolism, its design, were taken over during the following centuries. This monument is the largest wooden construction that survived the history of China. Surrounded by a wall 8m high and 3.8 km long, the city is protected by a ditch 50m wide. The set contains nearly 9000 pieces arranged on a very large space. Four doors were pierced, one per side. In the South, it is the door of the South, on the sides the doors of the glory (eastern and western), and in the north the door of the divine prowess. Each corner has an elaborate tower. Most of the important buildings are covered with yellow and white glazed tiles, the adjoining buildings are usually red tiles. Their bases are systematically marble terraces. What marks in this palace is the symmetry it shows. This symmetry follows the North-South axis, an axis that used to be that of the old city of Beijing. 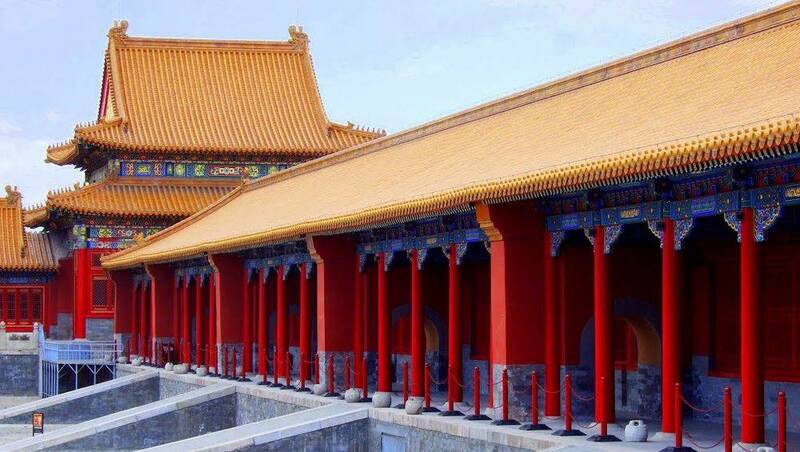 The Supreme Harmony Palace, the Middle Harmony Hall and the Preserved Harmony Hall (all in the outer courtyard) as well as the Palace of Heavenly Purity, the Union and Peace Pavilion, and the Palace of Earthly Serenity (in the inner courtyard) were built on this central axis. 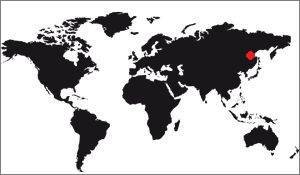 But these are not the only ones, the other buildings largely follow this axis. However it is not exact, there are many exceptions, as the plan shows. It may seem surprising because there has been so much work on this palace that one can wonder why it is not totally, symmetrical. It is necessary to look for the answer in its history since it has been modified regularly over time, deforming little by little the central axis. This is not the only explanation since even in its construction it was not completely symmetrical. Note that in another register, the Taj Mahal is perfectly symmetrical. Like what, all civilizations do not have the same conception of accuracy when it comes to architecture. 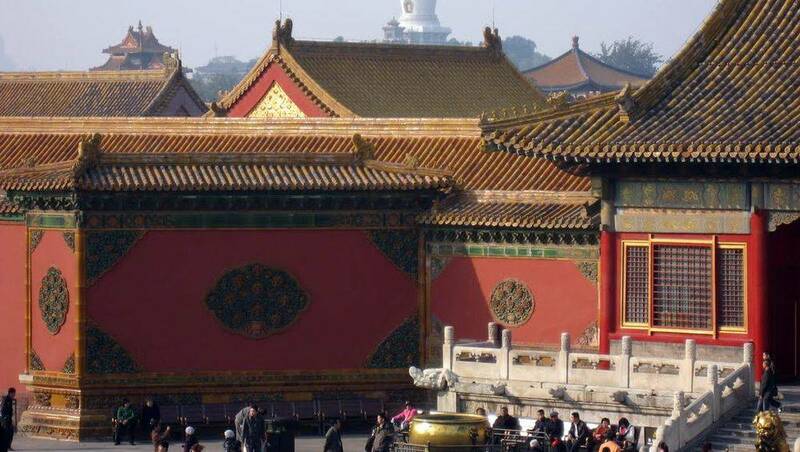 All of the Forbidden City's palaces were built on the basis of the Book of Changes and traditional Chinese Confucian culture. "The union of the human being and nature" is the main idea of ​​this book. In the names of "Palace of Heavenly Purity" and "Palace of Earthly Serenity", we can see the union of heaven and earth, a voluntary antagonism, of course. The palace gates were built on the basis of eight Chinese diagrams depicting the hope of harmony with nature. The ancients wanted to emphasize the balance between earthly life and celestial life by ensuring that both palaces are equidistant from the central axis. Moreover, in Confucianism the emperor had the status of supreme being. To govern the whole nation they wanted to build a superior city within the main city of China. A palace above the largest city, what ... This construction marks the Emperor's will to rise to the people. Then you have to know that traditional Chinese culture emphasizes the left side as that of improvement, promotion, while the right side is rather that of the demotion. Thus the temple of the Earth and crops is on the right, while the Ancestral Temple is on the left. Symbolically, we can conclude that terrestrial life (harvests) is of less importance than ancestor worship. The basic material of all the pavilions is wood. The beams and columns are the most important elements, they are the ones who structure each building. The walls, they are only auxiliary structures designed to cut the space into separate rooms. As a result, the windows could be changed easily, as needed. We did not hesitate to rebuild a wall with a new door, another wall can be reassembled completely. The palace evolved on demand, depending on the needs of each emperor, each user of a palace. As a result, the walls were no longer used for the maintenance of the pavilion, they then served as a support for decoration. The paintings had a dual function: Utility, with the application of a protective layer of wood, and decorator. The motifs are essentially dragons and phoenixes. There are three styles of decoration, perfectly identifiable. Imperial drawings: They are almost always dragons and phoenixes. 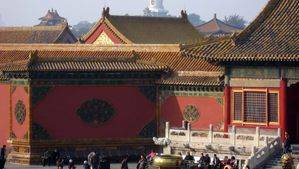 They are on the buildings of the central axis as well as on the main palaces of the forbidden city. Dragons are supposed to protect the Emperor's , so there is no reason to limit them: In all, there are some 12 654! The phoenixes, they, protect the empresses, they are represented standing. Decorative elements: These are ancillary decorations based on geometric motifs. Walls of annex pavilions, doors and smaller rooms are mainly found on the walls. Finally there is a 3 th style of decorations: Suzhou motifs. They are used on outbuildings, towers and gardens. Install four triangular ridges and, on each of them, lay four additional levels of beams on four sides only. This is a beautiful problem that would inevitably interest the current architecture teachers to make floor their students!